Insights about a Panama vacation from a jungle eco lodge offering deluxe accommodations, amazing naturalist guided adventure tours, delicious meals, and more in Bocas del Toro, Panama for your vacation. Call (713) 589-6952 (USA) to reserve now. From left to right: Short-billed Dowitcher, Red Knot, Greater Yellowlegs and Black-necked Stilt. I am happy to share with all of you the updated Clements list for the different locations where we go birding along the Western Caribbean Slope of Panama. At this point we have a total of 541 species in our list, and for the Tranquilo Bay grounds, a total of 221 species (+1 subspecies, the Yellow “Mangrove” Warbler). The updated bird list may be downloaded below. One of the last additions to our list was the Red Knot (Calidris canutus), a migrant shorebird that can nest as far as the North of Canada, and pass through Panama during its winter migration to southern South America. These birds can go through distances up to 15,000 km, between circumpolar breeding areas and winter grounds in South America, Africa, Europe, Australia and New Zealand. Last fall, during birding trips, we observed this species on two occasions, but only one individual, at the same area, the mouth of the Changuinola River. 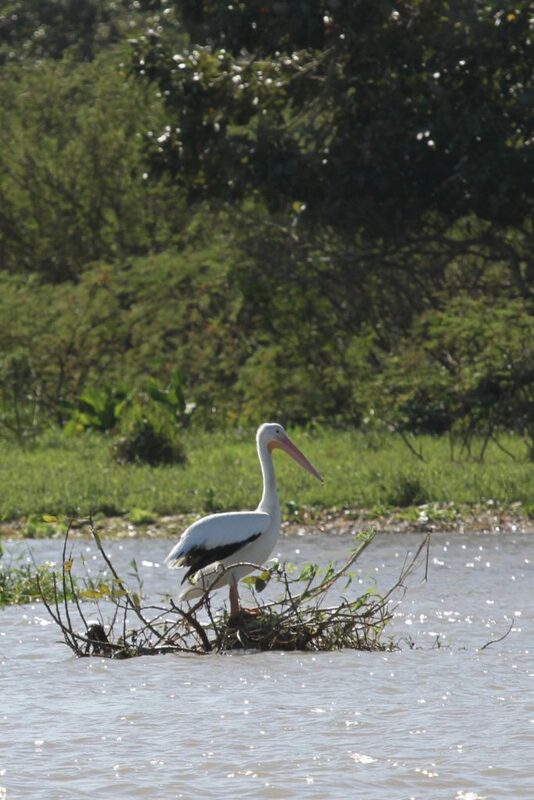 On the first of January we had a great site, while we were birding at the Snyder Canal, two American White Pelicans were resting near the mouth of the Changuinola River. This is the first time the species was observed and reported on this side of the country. 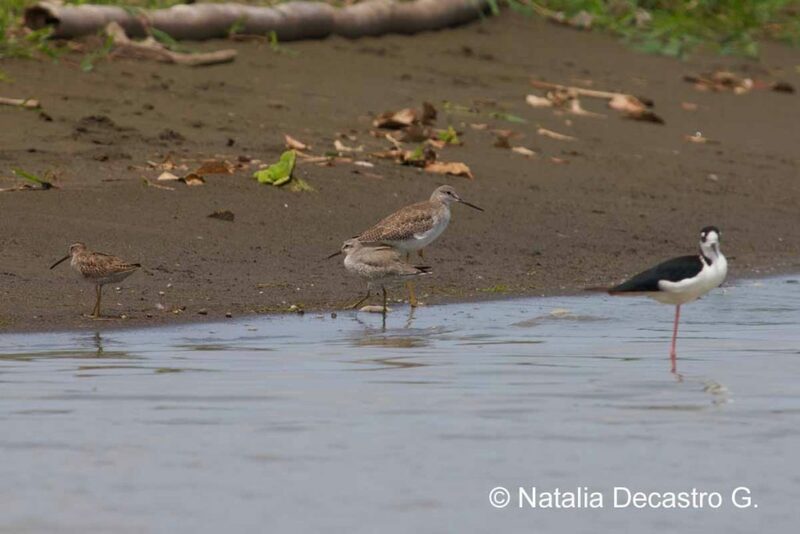 In Panama, the species is vagrant, with a few reports on the Pacific coast of Panama, in Herrera and eastern Panama, and recently one single bird has been observed, for over 3 years, at the Bay of Panama. These birds are the heaviest flying birds in the world; they feed on fish and other aquatic organisms, dipping their beaks into the surface of the water. 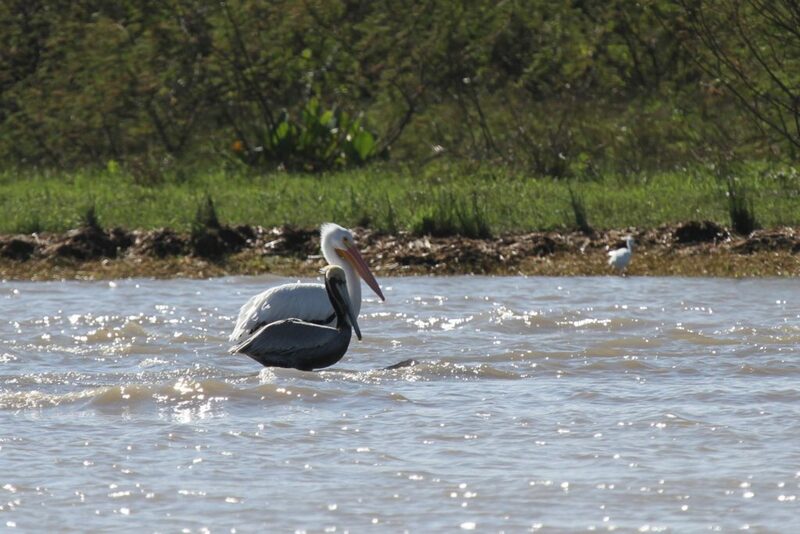 They do not dive like Brown Pelicans do. Almost the entire plumage is white, except the primary and outer secondary feathers are black. This species often travels long distances in large flocks. They are common and abundant in North America; breed at inland lakes, rivers or marshes, in Canada and United States; and migrate during winter to southern coastal areas. The mola is part of the traditional dress of the Kuna women. These indigenous people live both in Panama and Colombia. 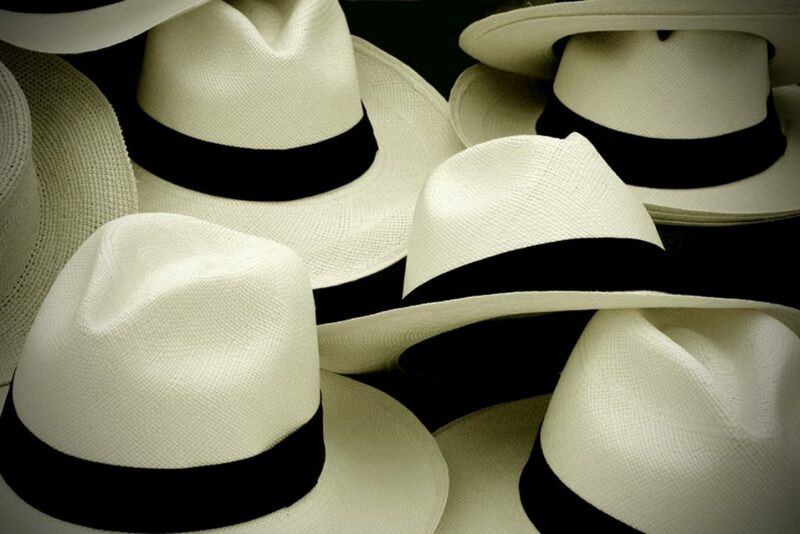 In Panama their land is called the Kuna Yala and is located on the Caribbean coast near Panama City and the canal area. Kuna people have migrated to other parts of the country over time and as such there are Kuna living in Bocas del Toro. This video describes how they make their molas. It is a beautiful work of art that takes quite some time when completed by hand. Today, I am going to talk about a couple of birds that were introduced by humans in Panama (and other countries): House Sparrow (Passer domesticus) and the Tropical Mockingbird (Mimus gilvus). The definition of an introduced species or non-native species (plant or an animal) is that it (said species) does not naturally belong to a specific area. We, humans, have been moving plants and animals around the globe for a very long time. 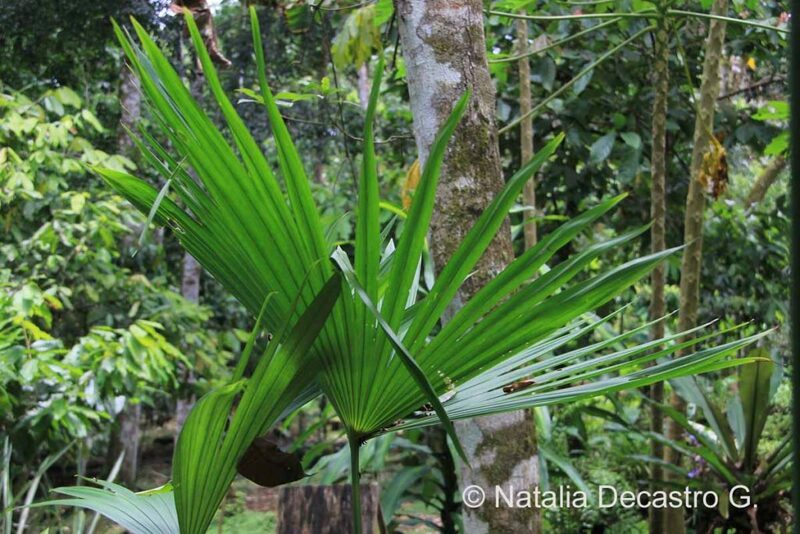 There are many reasons why introduced species are moved from one place to another. To mention a few: as a source of food, to control pests or simply because its pretty. Sometimes the introduction of this species goes well, and solves a problem, but the completely opposite can happen, and it turns into a pest that messes up the order the ecosystem. It is very well documented how the House Sparrow was introduced in to the United States, but not on the rest of the continent. 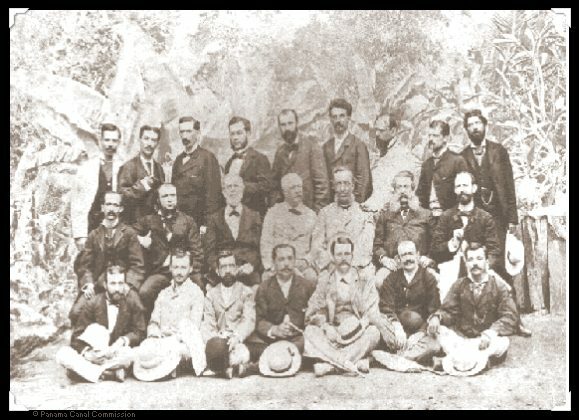 Since 1850 or 1851 the attempts to introduced the species in Brooking, New York began, and in a period of about 50 years, the species was found around the entire country. 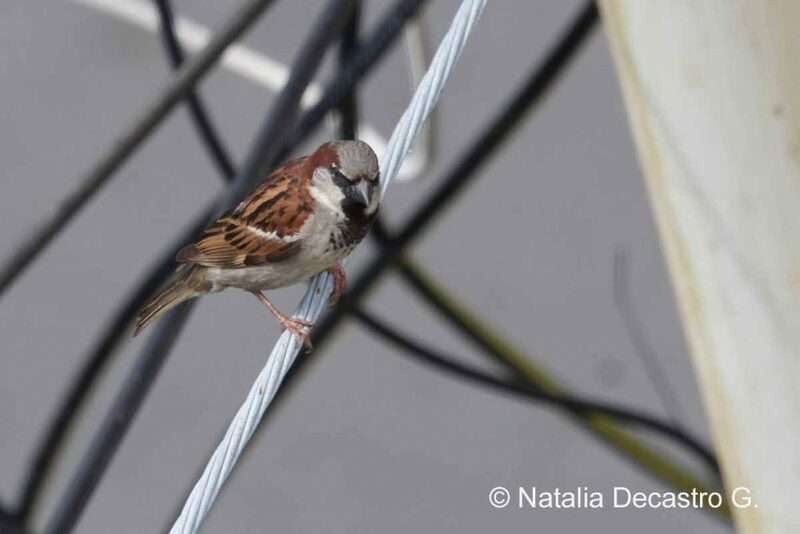 Native to Eurasia, the House Sparrow was brought in to North America, apparently for a few different reasons: 1) to control a pest of canker worms that was affecting the trees of Central Park, 2) to bring birds that were familiar to the immigrants, or 3) just because they are pretty. In Panama, this species is usually found in the lowlands, near humans, often in small flocks. Escaped and released pet birds are another way that a species makes its place in a country. 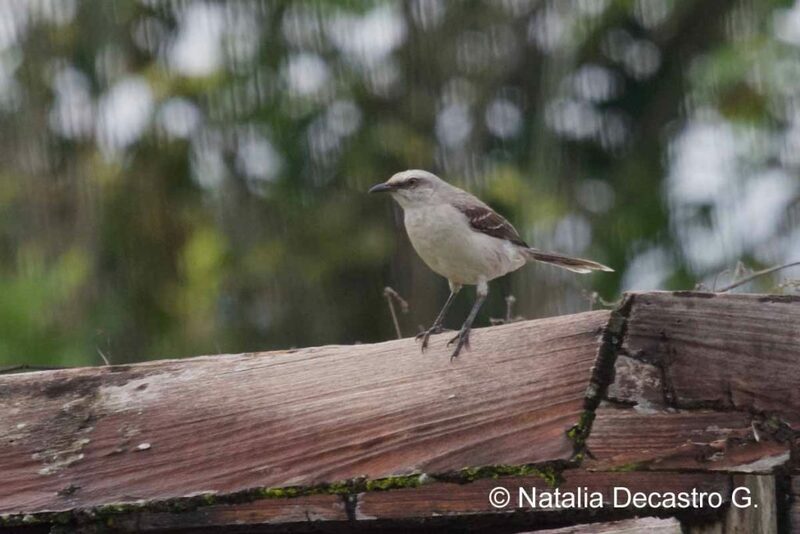 Now, I am taking about the Tropical Mockingbird (Mimus gilvus), a species introduced from Colombia around 1932. 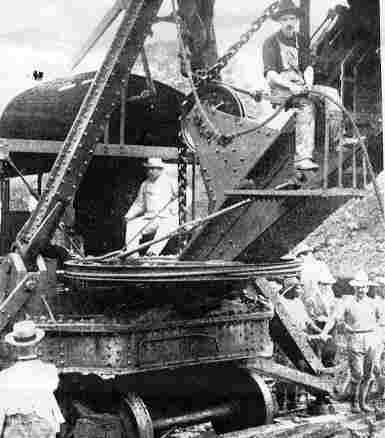 It was first documented at the Canal zone after 1928 (one report in 1932 by Deingnan (Wetmore et al. 1984)). Now it’s found in both urban and suburban areas. This species it is not common in Bocas del Toro. We have only seen a few individual birds in over 10 years birding the province, but just a few days ago, Scott Viola (Jay’s son), told me about a Tropical Mockingbird he saw on Isla Colon, which might be the first observation on that island for the species. Part of a group of Montezuma Oropendolas (Psarocolius Montezuma) flying over the new units and the forest behind them. The oropendolas are common visitors on the grounds around the cabins and the main building. At the Tranquilo Bay we have two morphs, that are quite similar, the bright orange, almost red with light blue toes and fingers and the bright red with tiny dots on the back. 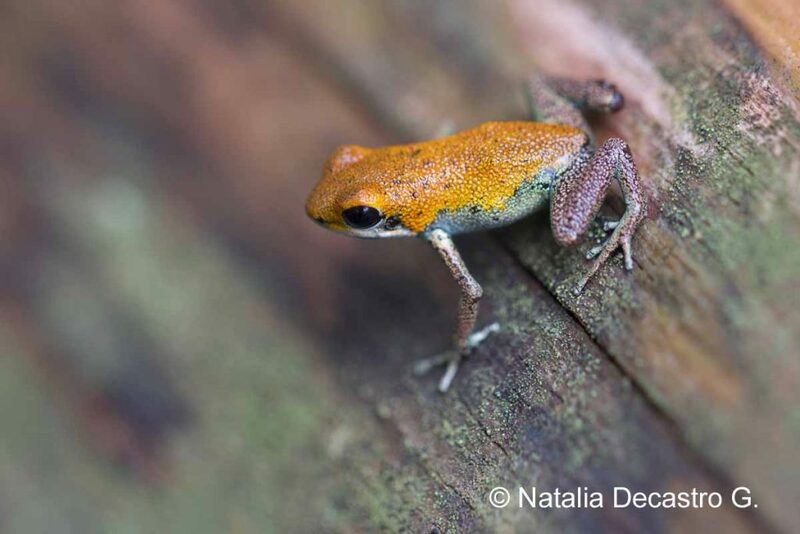 One of the morphs of the Poisonous Red Frog (Oophaga pumilio) found on Popa Island. 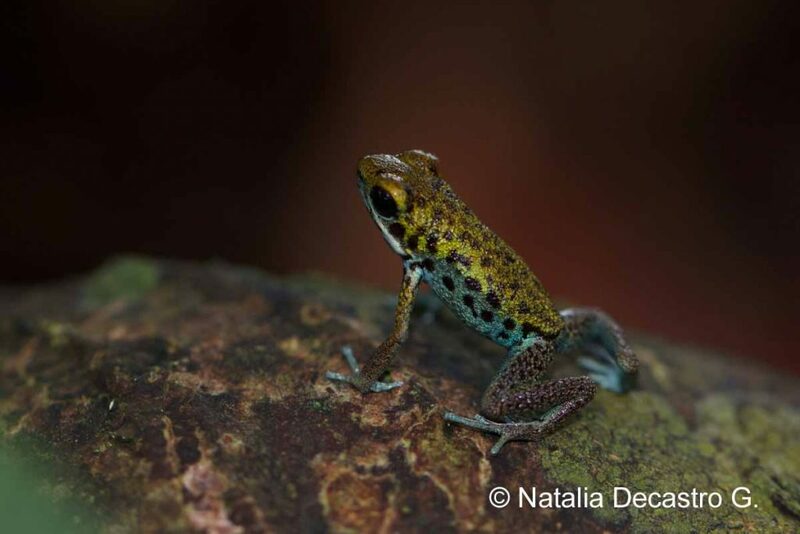 During this trip to Popa Island we got to see some nice variations in color of the Oophaga pumilio, and we also got great looks and pictures of some other species. 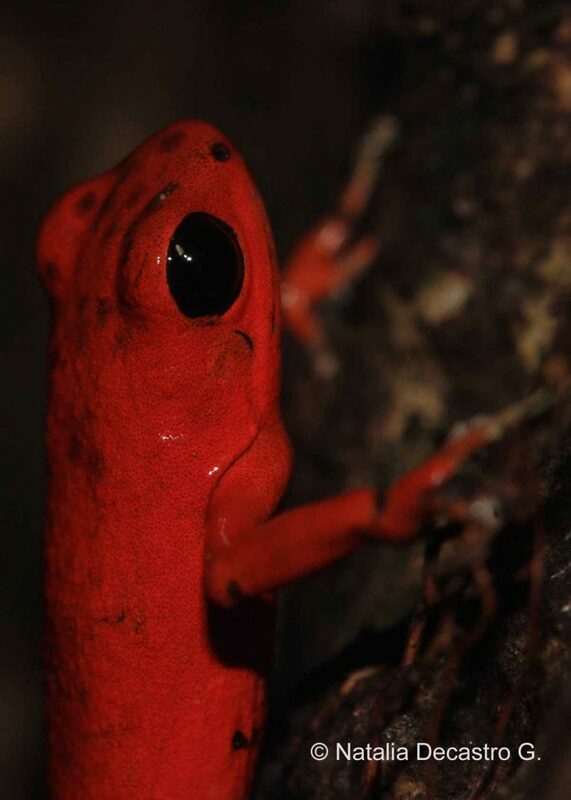 Another coloration of the Poisonous Red Frog (Oophaga pumilio) found in Popa Island. I have to admit that I never get tired of watching the incredible variation in color of O. Pumilio. It isn’t every day that we get a photographic opportunity to capture a photo of the elusive, and very fast amphibian, the Lovely Poison Frog (Phyllobatrs lugubris). 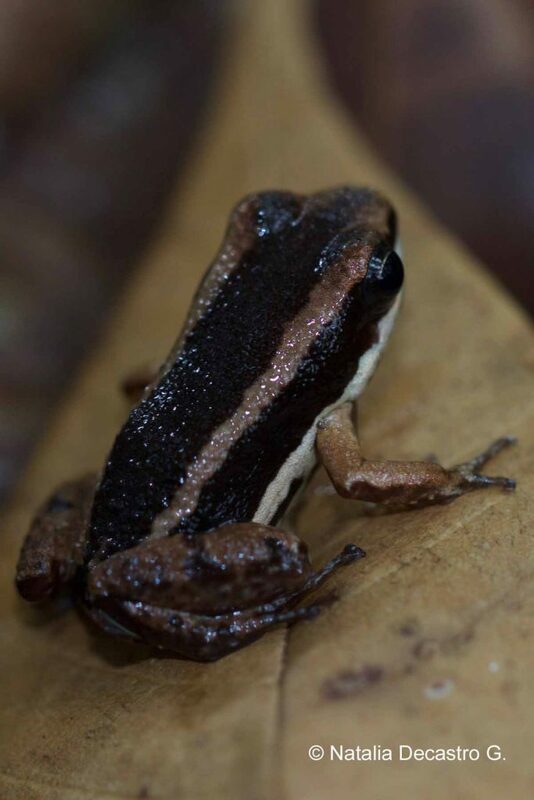 And if the morning could not get any better, we also found another small inhabitant of the rainforest, a Talamanca Rocket Frog (Allobates talamancae), that showed up and stayed calm for us to photograph him as well. 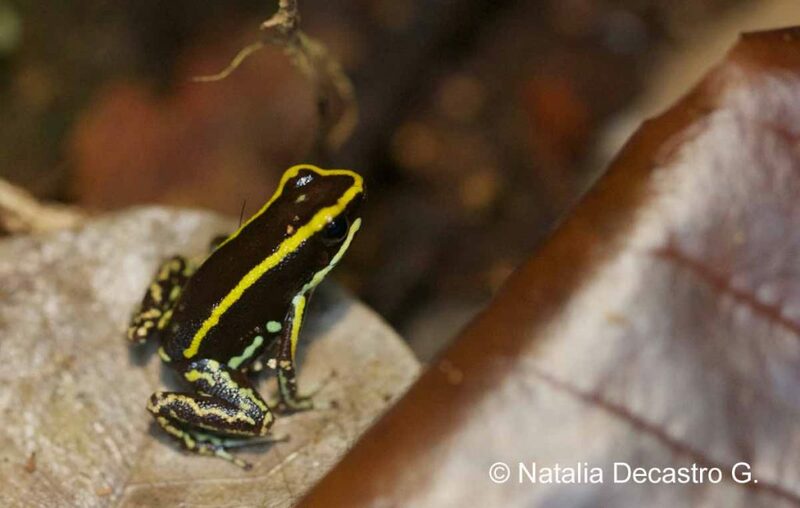 This quick video shows you a Poison-dart Frog (Oophaga pumilio) male singing a love song on Popa Island. While Natalia was making the video, a hummingbird (female Crowned Woodnymph) came to check on us, unfortunately she could not get her in the video. Sometimes we capture some pretty cool little clips that we would like to share with you, but we are not ready for a full video. So, to pass on the cool stuff, we are introducing Bocas Shorts – a video series that is well under a minute yet gives you a quick glimpse into some thing uniquely Bocas del Toro, Panama. Here is episode 1 where we show you how a Ngabe woman begins processing the leaves she uses to ultimately make a chacara.